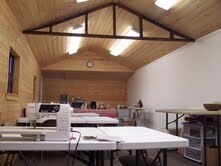 The classroom at Sleepy Valley Quilt Co. is bright and airy, with a full length design wall, plenty of tables, chairs, ironing boards and irons. When the classroom isn't being occupied by scheduled classes, we encourage folks to call ahead and reserve it for special quilting and sewing meetings! This class is for the person who wants to learn quilt-making and for the quilter who wants help improving skills. The techniques are all here, including rotary cutting, hand piecing, appliquÃ©, English paper piecing, foundation piecing, mastering that elusive 1/4" inch seam, machine piecing, working with templates, how to decode a pattern, dealing with sashes and borders, sandwiching the layers - and, the best part, you'll have a beautiful 12-block quilt to prove what you've learned, and to enjoy for the rest of your life! If you have taken the Beginner Sampler class, and would like to continue to build skills, try new techniques, and gain confidence, while learning twelve new block patterns, this class is for you. Included are: rotary cutting, applique techniques, foundation piecing, re-perfecting the "1/4" seam, working with templates, machine piecing (including the "Y" seam), and tons of useful information â€“ and your beautiful sampler quilt will be the proof of all you have learned!